덕온공주(德溫公主:1822~1844)는 순조(純祖)의 3녀로 순조 5년(1822) 6월 10일에 출생하여 헌종 3년(1837) 16세 되던 해 남영위(南寧尉) 윤의선(尹宜善)에게 하가하였다. 헌종 10년(1844) 5월 헌종 계비 간택에 참여하였다가 드신 음식이 잘못되어 당시 수태중이던 아기와 함께 궁중에서 돌아가셨다고 한다. 공주가 생전에 사용하였던 유물들은 윤용구 딸 윤백영(尹佰榮) 여사가 보관해 오다가 1960년대부터 여러 차례로 나누어져 석주선(1911~1996)교수에게 기증하였다. 현재 이 유물은 현재 단국대학교 석주선기념박물관에 소장되어 있다. 이 가운데 자적색 직금당의 1점은 1964년 중요민속문화재 제1호‘덕온공주 당의’로 지정되었으며 나머지 유물 일습은 복식 6점과 기타 수식류와 생활용품 33점으로 나누어 1987년에 중요민속문화재 제211호와 제212호로 각각 지정되었다. 제211호‘덕온공주의복’에는 원삼 1점, 당의 1점, 장옷 1점, 삼회장저고리 1점과 누비삼회장저고리 2점으로 총 6점이다. As the third daughter of King Sunjo, Princess Deokon (1822-1844) was born on June 10 during the reign of King Sunjo of the Joseon Dynasty (1822). At the age of 16 in the 3rd year of King Hunjong’s reign (1837), she married Yun Ui-seon, who was working as Namyeongwi. In May of King Hunjong’s reign (1844), she participated in the event of selecting a new wife for King Heonjong but fell victim to food poisoning and died at the royal court with her baby still in her womb. 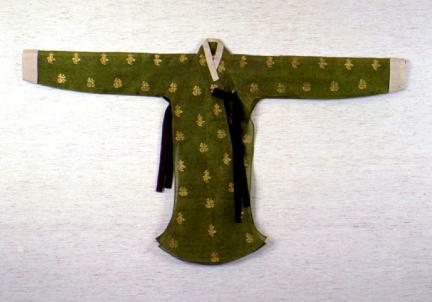 The artifacts used by the Princess had been kept by Ms. Yun Baek-yeong who was a daughter of Yun Yong-gu. 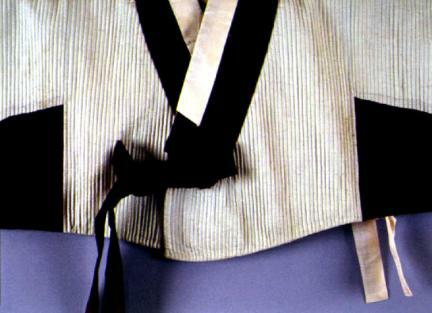 In the 1960s, they were donated to Professor Seok Juseon (1911-1996) over several occasions. 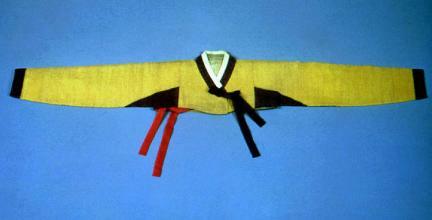 The complete outfit is kept at the Seok Juseon Memorial Museum of Dankook University. 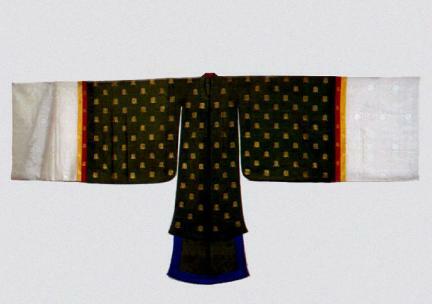 Among the artifacts, one reddish purple jikkeumdang (ceremonial robe) was designated as Important Folk Cultural Heritage No. 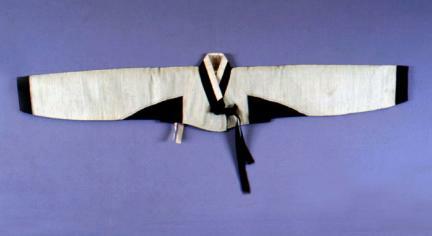 1 -- “Dangui Worn by Princess Deokon” -- in 1964. Other artifacts were divided into 6 pieces of clothing and 33 items of accessories and daily miscellaneous items and designated as Important Folk Cultural Heritage Nos. 211 and 212 separately in 1987. Heritage No. 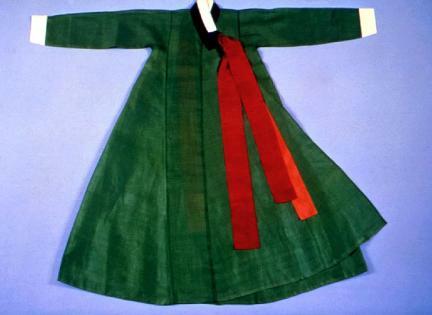 211 -- “Clothing Worn by Princess Deokon” -- consists of a total of 6 items: 1 wonsam, 1 dangui, 1 ladies’ veil, 1 samhoejang jeogori (gusset-lined, triple-layered Jeogori), and 2 quilted samhoejang jeogori.